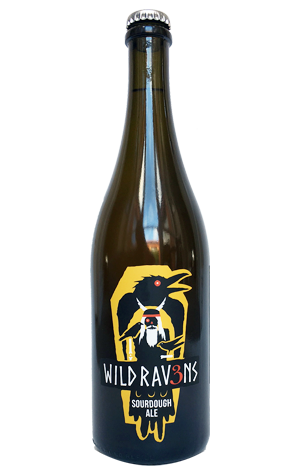 The fifth in the rapidly growing Wild Ravens series is a beer that came about as an unexpected bonus from some experimentation on the part of head brewer Brendan O'Sullivan and his mates Pippa and Michael at South Yarra's Tivoli Road Bakery (where Brendan's sister has worked for a few years). The latter specialise in sourdough bread, croissants and pastries, have picked up awards galore for their hot cross buns, use 3 Ravens' Druid in their Christmas pudding, have worked with the brewery's spent grain and are now experimenting with its mixed culture too. In short, there's plenty of common ground. The exchange of goods has been two-way too. More than six months ago, they set out to barrel ferment some Berliner Weisse using wheat levain in one barrel, rye starter in another. Brendan didn't have particularly high hopes, but was delighted with the result – particularly with the rye barrel, where he detected stonefruit and grape characters. So the two barrels were blended and released as the Sourdough Ale. And it's quite delightful: crisp, lightly acidic, subtly complex and wine like with a fine carbonation and fruit characters they define as apple, grape and apricot.